“I want to be a living work of art” declared the Marchesa Casati, muse of a hundred artists from Man Ray to Karl Lagerfeld. The Beaux Arts Ball is based on Artists Balls of the 1920′s and 1930′s, and avant garde artists and fashion designers who raised costumes to the level of “living works of art”. For example, Picasso designed costumes and set for the Ballet Russes, and Erte designed costumes for the Chicago Opera company, Folies Bergere and more. These creatives blurred the lines between art, fashion and theatre, and this is also our aim. At our Beaux Arts Ball, we will have fifty Living Works of Art, created by some of Perth’s hottest emerging artists and designers. 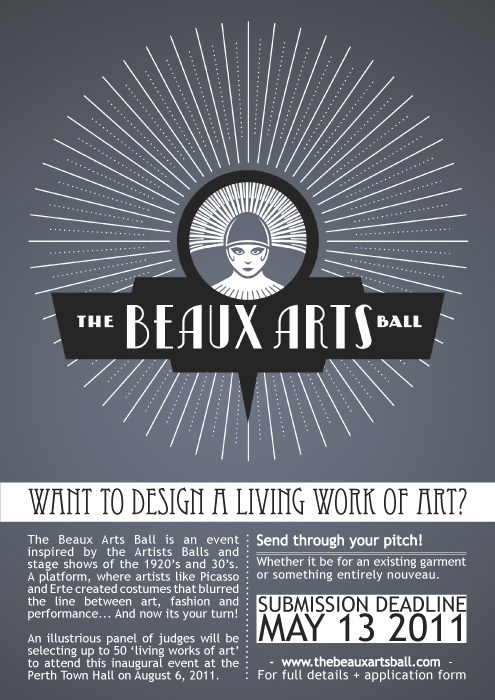 Applications to be a Living Work of Art at the Beaux Arts Ball closed on 31st May 2011. For reference, we will leave the application information available here. Email any questions to kat@VJzoo.com and we will add a list of FAQs here. Please read this entire website before applying. Then, download the Application Form and Notes, then email or mail your completed Application Form back to us with whatever you think may help to explain your idea – sketches, photos, digital images. Individuals and organisations (including Art Schools, businesses, theatre companies etc) are welcome to apply. The most impressive and appropriate costumes will be chosen, so make sure you watch our Costumes of the Jazz Age video and read the other information in our Style Guide. A bursary (ie, a small payment) will be available to assist with the cost of making your creation if your design is chosen as a Living Work of Art. The amount of this payment will depend on sponsorship and/or funding received but will be advised to successful applicants. Successful LWAs will receive one free ticket to the Ball. If you choose to have a model/muse as your LWA, you would need to buy a ticket to attend yourself. Artists retain ownership of the costumes and litters, but any that are unwanted after the event can be auctioned off to raise money for an arts-based charity. If you want to auction off your own costume, we’re happy to help promote that too. It’s yours to sell. At the event, your responsibility as a Living Work of Art is to pose in your appointed position for five minutes each hour; and also to take part in a Grand Procession around the inside of the venue. Apart from that, please enjoy the party and mingle as much as your costume will allow, eat, drink and be merry – and gorgeous! Terms and conditions are listed on the Application Form. LWAs will be photographed and videoed, and to avoid complexity we require rights to use these images in all media. We will request full crediting of all usage, but this is not always possible. LWAs and their creative team will also able to use the images at high resolution for their own promotion at no cost (crediting wherever possible). LWAs must be completed and available for a Dress Rehearsal and Photo Shoot the day before the Ball. Having your application to produce an LWA does not guarantee that you will be in the Ball however – we retain the right to refuse entry if your final LWA isn’t up to the standard of your pitch. Artists are encouraged to find personal benefactors (sponsors) to assist with the costs of preparing their LWA. The sponsor will receive promotion through the website and book after the Ball, as well as use of images for their own promotion. We hope to encourage ongoing, mutually beneficial relationships between artists and businesses in this way. For example, hair salons, boutiques and jewellers would be very appropriate partners for some LWAs. If you are interested in being a model rather than an artist, please complete and return the Model Application Form with at least one good clear photograph of yourself, and we will suggest matches with artists who have not secured a model and don’t want to wear the costume themselves. If you are a professional model, you must check with your Agency that your contract does not breach our terms and conditions (especially in relation to our rights to use any images). We want models of all shapes and sizes, but some existing costumes will require a model to fit, hence asking for measurements etc. Closing date for this is also Tuesday 31st May. The Beaux Arts Ball is not able to pay models. If you require payment, please specify and we pass this info on when suggesting models to artists. Glorifying the American Girl (1929) – currently only available in poor quality B+W, but original colour scenes are being restored but have not been released on DVD. Features original footage of genuine Ziegfeld performances. La Revue des Revues (1927) – mostly just a bunch of Parisian stage numbers from the 20′s, in original colour. But what numbers they are! Madam Satan (1930) – incredible de Mille production with a costume ball on a zepplin. Fashions of 1934 (1934) – sadly, not available to buy. One of Busby Berkeley’s more obscure films. You can vote for it to be released and also see the trailer at TCM. It took us years to track this down, it contains an incredible mass fan-dance scene. Metropolis (1927) – classic Sc-Fi, but also contains stunning stylised dance scene. Zou Zou (1934) – featuring Josephine Baker in a bird cage. Need I say more? Just Imagine (1930) – bizarre Sci-Fi musical that has to be seen to be believed. Siren of the Tropics (1927) – another great Josephine Baker feature. If you’re a Baker fan, it’s worth buying this boxed set. There is currently an exhibition of the amazing costumes of the Ballets Russes at the National Gallery of Australia – you can see many of the costumes online. 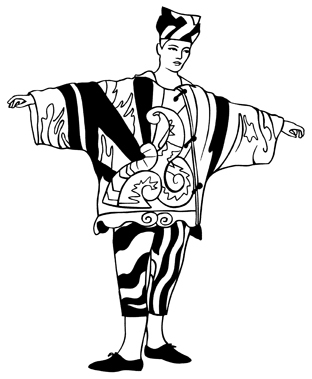 This costume was designed by Picasso for Ballets Russes. Many well known artists designed both costumes and sets for the Ballets Russes. 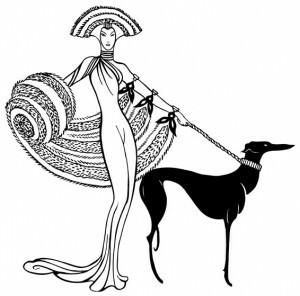 Erte also designed some incredible costumes for the Folies Bergère. Art movements of the period included Dadaism, Surrealism, Expressionism and the beginnings of Modernism. 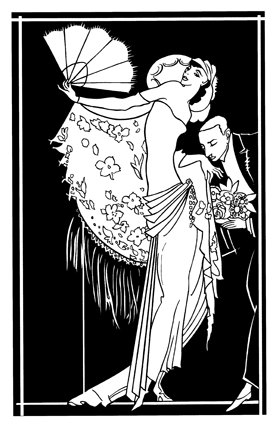 In design, the period was the transition from Art Nouveau to Art Deco. There’s a basic illustrated summary of these movements on katsclass.com (sorry about any dead links, I haven’t taught for many years and so this hasn’t been maintained).